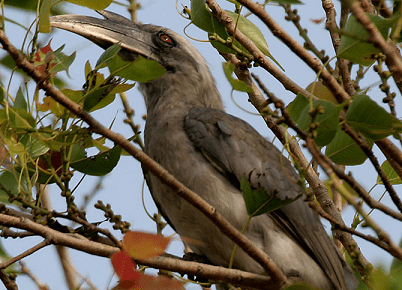 Indian grey hornbill (Ocyceros birostris) complete detail – updated. Description of Indian grey hornbill (Ocyceros birostris). 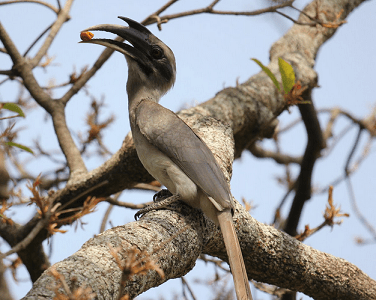 Classification of Indian grey hornbill (Ocyceros birostris) Dhanchidi-Dhanesh. They are found in pairs or small groups. Habit and habitat of Indian grey hornbill. They likes deciduous forest, parkland and open thorn-forest with fig trees. The tail has a white tip and a dark sub-terminal band. They have a red iris and the eyelids have eyelashes. The bare skin around the eye is dark in the male while it is sometimes pale reddish in females. The female has a more yellowish bill with black on the basal half and on the casque. Male has a larger casque on a dark bill, and the culmen and lower mandible are yellowish. The bare skin around the eye is dark in the male, but sometimes pale reddish in females. Nesting season is between February to June. They usually nest in tree hollows on tall trees. The female stays inside the nest and nest entrance is sealed by the female using its excreta and mud-pellets supplied by the male. While inside the nest, the female moults her flight feathers……………. Indian grey hornbill is a beautiful bird. Size between 55 cm. to 70 cm. 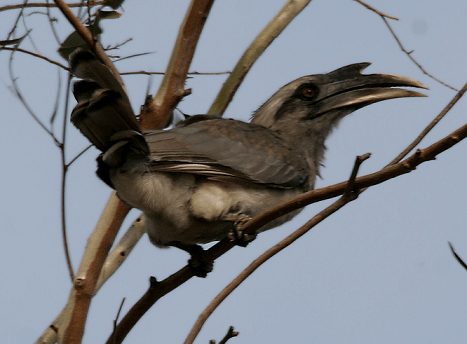 Indian grey hornbill have grey feathers all over the body with a light grey or dull white belly. Ear coverts are darker. Upper parts are light (dark some time) greyish brown and there is a slight trace of a pale super-cilium. Flight feathers of the wing are dark brown with a whitish tip. The tail has a white tip and a dark sub-terminal band. They have a red iris and the eyelids have eyelashes. The bare skin around the eye is dark in the male while it is sometimes pale reddish in females. The horn is black or dark grey with a casque extending up to the point of curvature in the horn. The casque is short and pointed. Male has a larger casque on a dark bill, and the culmen and lower mandible are yellowish and female has a more yellowish bill with black on the basal half and on the casque. The bare skin around the eye is dark in the male, but sometimes pale reddish in females. Indian grey hornbill is found mainly on the plains up to about 2000 feet. Indian grey hornbill found in most parts of India, from the Himalayan foothills, southwards through the Indian peninsula, absent in the very dry areas of western India, and in wet forests of the Western Ghats and north-eastern India. 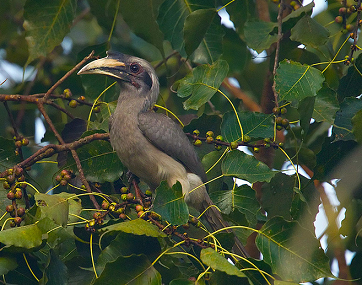 Indian grey hornbill also found in parts of Pakistan, Nepal and Bangladesh. In deciduous forests, woodlands, thorn forest, can be also seen in city gardens, plantations and parks. 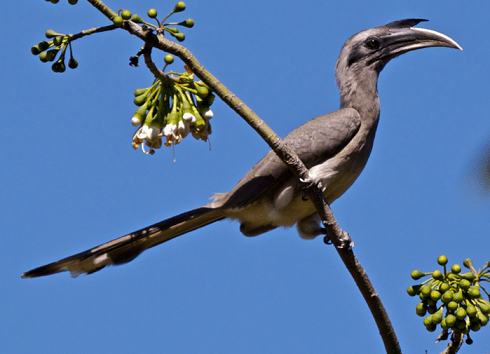 Indian grey hornbill likes deciduous forest, parkland and open thorn-forest with fig trees. Also found around rural cultivation and in gardens. They are found in pairs or small groups. Often seen flying from tree to tree, sometimes on the ground. The flight is heavy and involves flapping interspersed with glides. 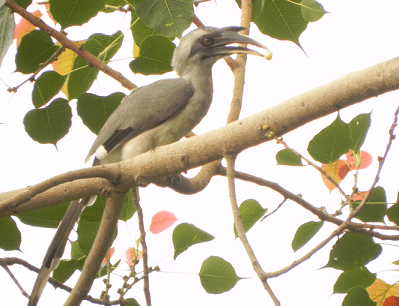 Indian grey hornbill feed on fruits, nuts, seeds, small insects, lizards, and small snakes. Calls is a shrill “wheee”; the other is a cackling “k-k-k-kae”. Nesting season is between February to June. They usually nest in tree hollows on tall trees. The female stays inside the nest and nest entrance is sealed by the female using its excreta and mud-pellets supplied by the male. While inside the nest, the female moults her flight feathers and incubates the eggs. Eggs 2 to 5, white in color. The regrowth of the female’s feathers coincides with the maturity of the chicks, at which point the nest is broken open. After the emergence of the female from the nest, she joins the male to feed the chicks in the nest.